The Rayovac Ultra Pro Alkaline AA Batteries are the smart choice for your battery powered devices because they last as long as other leading brands, but cost less. These top-performing AA batteries have been specifically designed for use in portable digital electronics ideal for the modern lifestyle. From portable CD and MP3 players to handheld video games, Rayovac Alkaline batteries provide long-lasting power for a lot less money. 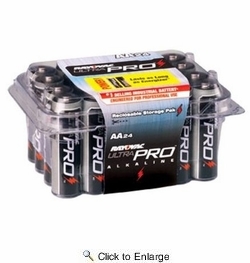 UltraPro Alkaline Batteries - Built to exceed the performance demands of industrial applications. Contractor Packs feature convenient reclosable, reusable containers that protect against damage and short-circuiting. Mercury-free formula - better for the environment. Guaranteed against leakage.